Keep Pets Safe on July 4th! 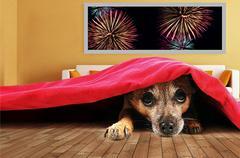 Independence Day means lots of unusual noise and resulting agitation and fear for many animals. This can make July 5 the busiest day of the year for animal control professionals. Place identification on pets. Micro-chipping is a good idea for those pets that seem to always escape from their collars. Local animal control shelters offer low-cost micro-chipping for your pet! Your pet’s information will be registered in a national database so no matter where you travel, your pet can be identified. Keep your pet indoors with a radio or television playing in the background. This can serve as a distraction and offer a sense of comfort for your pet. Additionally, sedatives can be prescribed by your veterinarian for those highly excitable pets likely to suffer extreme anxiety from the fireworks. DO NOT take your pet to a firework show or even a neighborhood gathering. They are safer at home. Parents should supervise children. They are not likely to understand the adverse effects that fireworks have on pets and may accidentally let the family pet out. If a pet turns up missing, visit your local animal control shelter the very next day. If you don’t see your pet there, keep looking. They may have strayed quite far trying to escape the fireworks.